Big Data & Data Science Blog: How to select AI and Big Data use cases? How to select AI and Big Data use cases? Many organizations that start working with Big Data and Artificial Intelligence (AI) ask themselves the question: where to start? In general, there are two ways to start: 1) start building the capabilities needed to use AI and Big Data (infrastructure, data, skills, etc. ), and 2) start with use cases that show the potential value to the organization. Most organizations choose the second option since it is easier to invest in capabilities once there is a clearer understanding of the value that can be generated. But how to choose the best use case to start with? In our experience, the best way to attack this problem is by building an opportunity matrix (also called the Ansoff Matrix) with the specific Data and AI opportunities for the organization. Let’s say, you want to apply Robotics Process Automation (RPA) as part of your AI strategy, and you want to decide what process to start with. The most successful applications of RPA are on processes that are highly-structured and apply to the core business. Figure 1 illustrates how such a matrix could look like, where the size of the circle represents the business value, and the colour the risk involved. 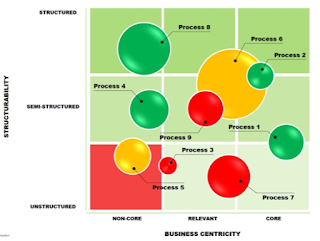 The ideal processes to start with would be large, green ones in the top right. But how do we apply the opportunity matrix to Data and AI use cases for organisations that want to start? Usually, the two main axes represent value or business impact and feasibility. Value is important because demonstrating a use case on something that is of lateral importance to the business doesn’t convince the organization to invest. Feasibility is important because the results should not come in two years, but in months: the patience of businesses for results of new things is limited. However, other dimensions can be used for the axes (such as urgency to act); this depends on what is most important for the organisation at the time of starting. The additional dimensions (size, form, and colour) should represent other important factors to consider in the decision process. 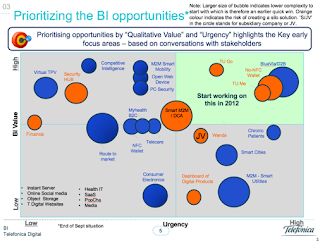 Figure 2 illustrates an opportunity matrix for big data and digital services when Telefonica Digital started its Big Data journey back in 2012. Here we prioritized the digital services that should include big data (business intelligence) capabilities according to value and urgency. The size of the bubble represented how simple (less complexity) it was to work on the topic, resulting in quicker results. The colour represented the risk of creating a silo solution as opposed to an integrated solution (preferred) where data of all digital services was stored in one single big data platform. Sometimes it is hard to estimate the business value of a use case before actually executing it. A good way to estimate the business value of a use case is to multiply the business volume with the estimated percentage of optimization. For instance, if the churn rate of a company is 1% (per month) and there are about 10M customers, with an ARPU (average monthly revenues) of €10, then the business volume amounts to €1M per month or €12M per year. If Big Data could reduce the churn rate by 25%, that is, from 1% to 0.75%, then the estimated value would be €250.000 per month. The other important dimension to estimate is the feasibility of use cases. This is a more qualitative estimation which might be different per organization. Basically, it estimates how easy or difficult it is to execute the use case, including factors such as the availability of data (location, ownership, cost), the quality of data, the collaboration with the business area (some are champions, others are defensive), the privacy risk, etc. But how to get an overview of what use cases to consider for your industry? 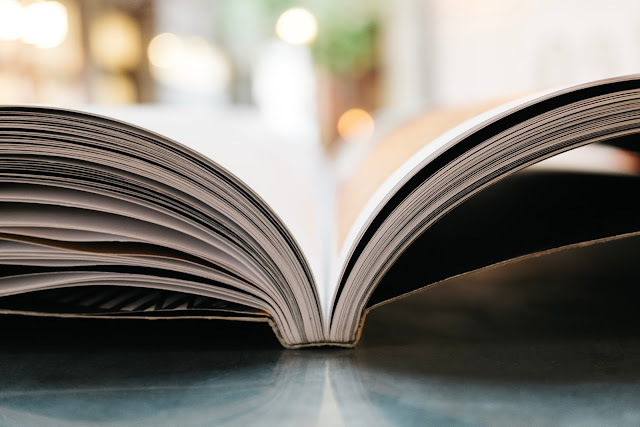 Many organisations have an initial idea of some use cases (such as upselling or churn reduction) but might lack a deeper understanding for coming up with a more exhaustive list of use cases to consider. Luckily, there is enough sector-based literature to help organizations with this step. For the telecommunications industry, for example, the TM Forum maintains a list of about a hundred uses cases along with important characteristics such as data requirements, privacy risk, value, etc. 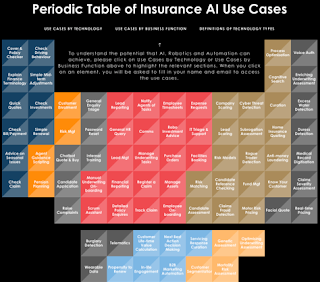 For the insurance industry, the website at http://wisetothenew.com/ai/ provides an overview of many Artificial Intelligence use cases (see Figure 3). And then there are of course the usual research reports, reporting many use cases for different sectors such as the McKinsey report on Artificial Intelligence focusing on the sectors Retail, Utilities, Manufacturing, Healthcare and Education, and the PWC report “Sizing the price”. 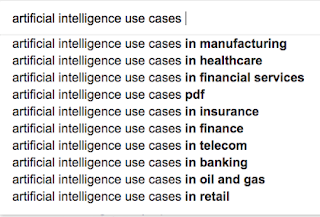 If you are looking for AI use cases in a particular sector, you can, of course, use a search engine, which will provide you with many suggestions, as illustrated in Figure 4.